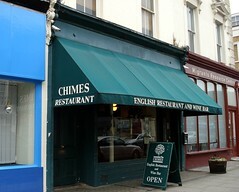 Chimes was a long-standing English restaurant and cider/perry/wine bar in Pimlico. It has now closed. According to Google Street View, as of May 2015 there was a "to let" sign in the front window. English restaurant and cider/perry/wine bar in Pimlico. The decor inside is mostly polished dark wood. There's a restaurant area at the back, a bar area at the front, and (in good weather) a couple of small tables on the pavement outside. Four handpumps for cider and perry are mounted on the bar. The drink options are focused on real cider, real perry, and English country wines (e.g. elderberry wine); they also stock mead, as well as a few grape-based wines. A half-pint of Weston's perry was £2 in March 2012. The food is traditional English with a focus on pies, and there are very few vegetarian options on the menu. If you want to eat in the restaurant section, booking is advisable, but space is usually available in the bar section at the front. Kake's verdict: I really like it here, and have done since I first visited in 2002 or so. There are now several places in London offering a good selection of real cider, but Chimes also has some interesting fruit wines and I find it generally more relaxing than the newer, "hipper" places. If you like real cider, it's definitely worth a journey. Accessibility: A small step to get in. Toilets are in the basement. Last visited by Kake, March 2012. Last edited 2015-09-17 05:44:33 (version 12; diff). List all versions. Page last edited 2015-09-17 05:44:33 (version 12).